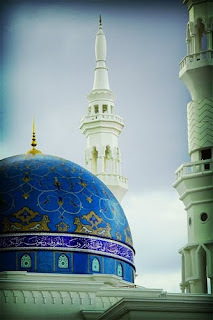 Untuk melabur: +60192348786 (Sanusi, KL) atau +60199539330 (Rozanna, Kajang). 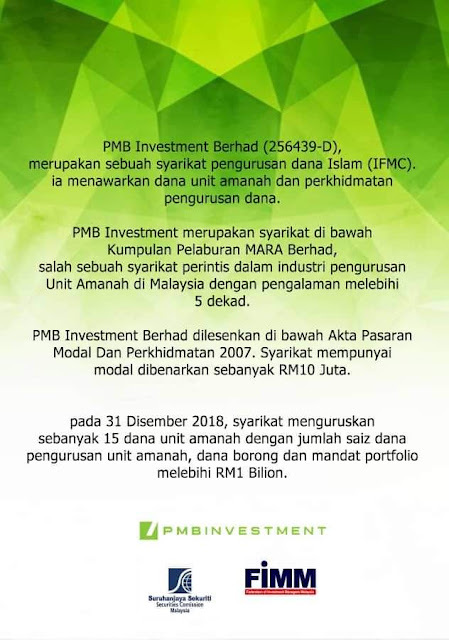 PMB INVESTMENT merupakan sebuah syarikat pengurusan dana Islam (IFMC). 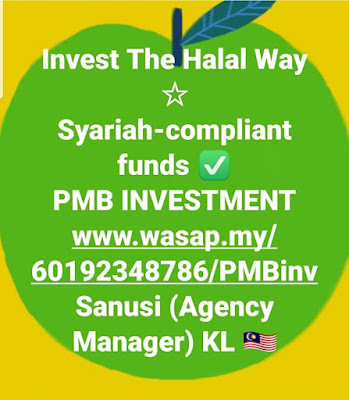 PMB Investment Berhad (256439-D) is an Islamic Fund Management Company (IFMC). 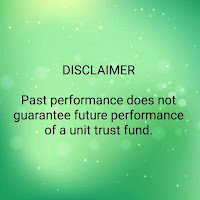 It offers unit trust and fund management services. 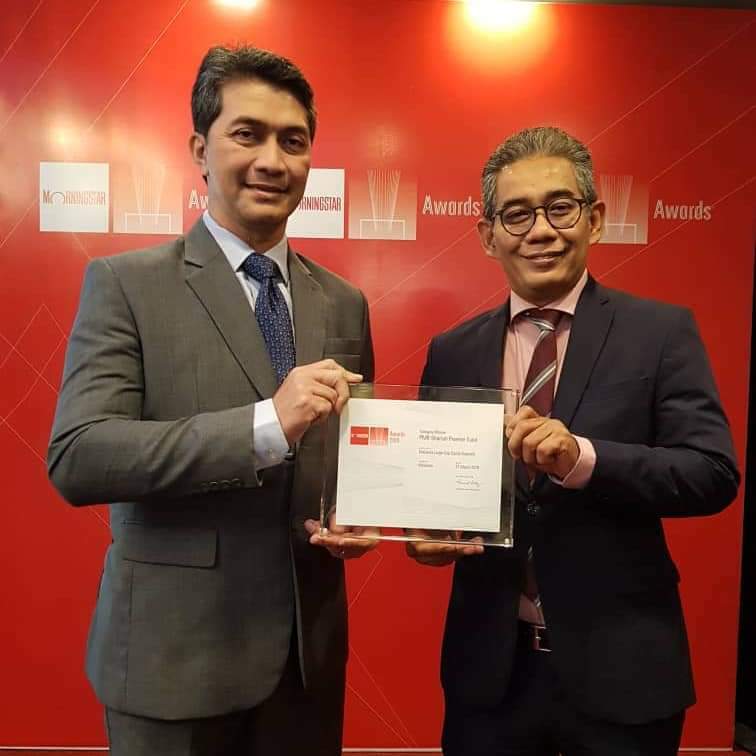 It is a wholly-owned subsidiary of Pelaburan MARA Berhad, one of the pioneers in the unit industry in Malaysia with more than five decades of experience. The company assumed its current name on 28 February 2014 following a rebranding exercise of the group. This is to reflect the name change of the parent company from Amanah Saham MARA Berhad to its present name. 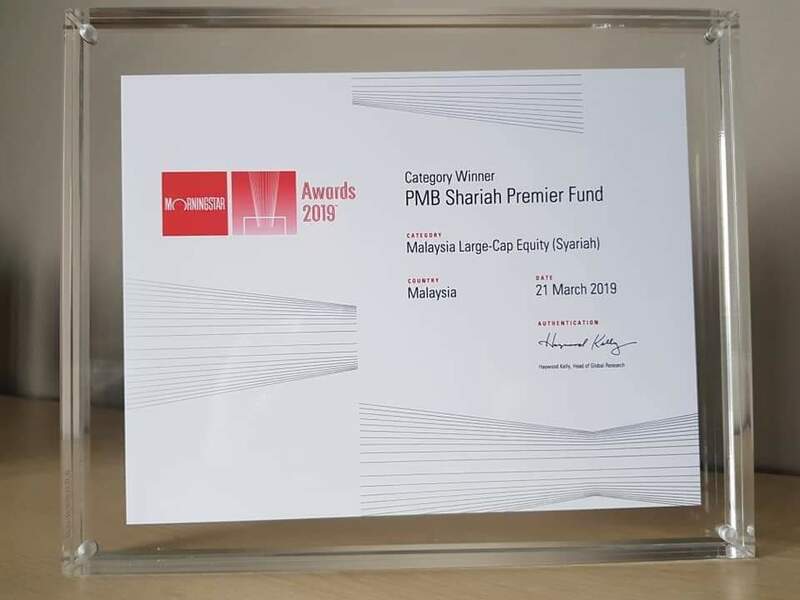 In line with one of the initiatives of the group’s Transformation Plan 2011-2015 to make the group strong, sophisticated and competitive, all unit trust funds and corporate / institutional portfolios are now Shariah compliant. 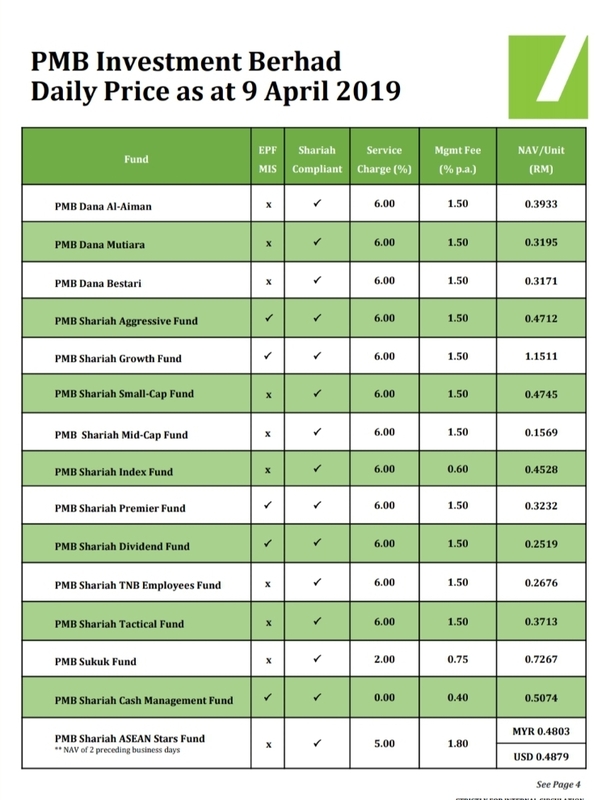 The last two unit trust funds were officially made Shariah- compliant on 7 March 2014. 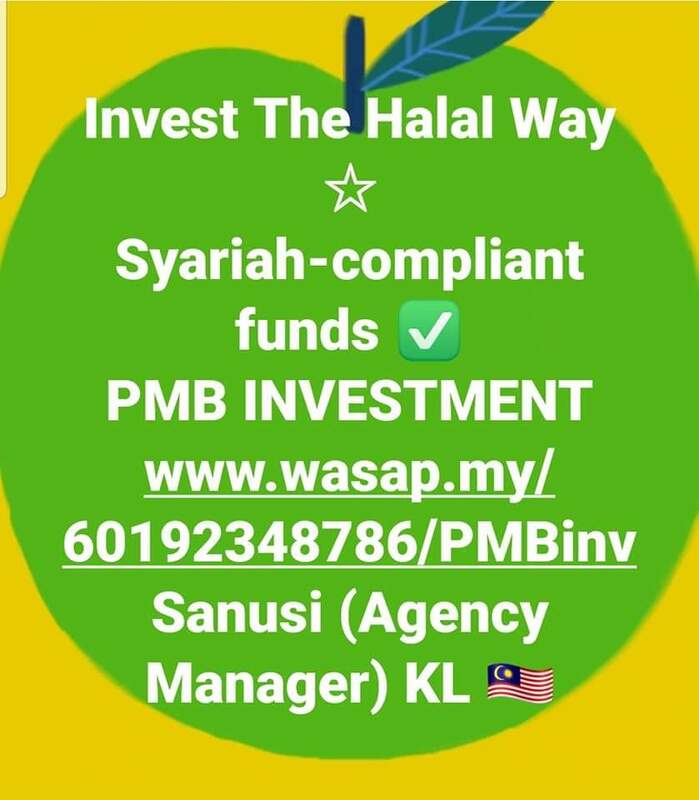 We received approval from the Securities Commission Malaysia to change our regulated activity from fund management to Islamic fund management with effect from 28 November 2014. We offer discretionary portfolio mandates for investments in Shariah-compliant equity, sukuk and Islamic money market instruments, or a combination of the any of the three asset classes as required by clients. 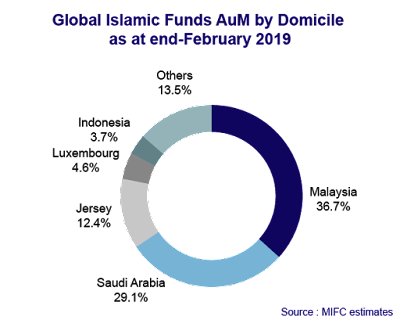 As a result of making conventional unit trust funds Shariah compliant, most of the unit trust funds we offer are unique although they may invest in the same asset class. 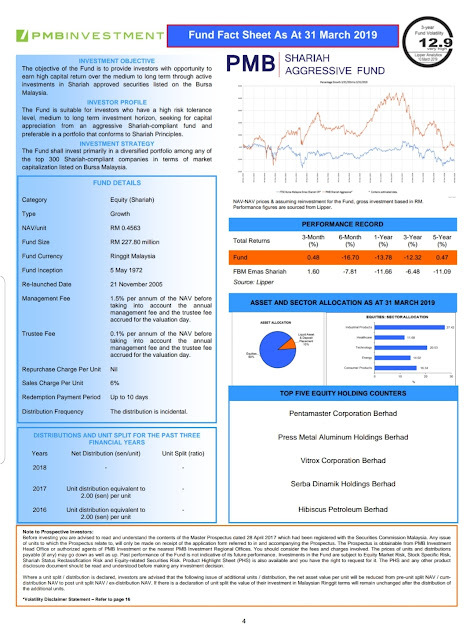 This is to enable investors, subject to the Suitability Assessment, choose funds that suit their risk tolerance level and investment objective. 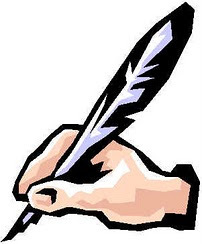 Please read and understand the contents of the Master Prospectus, which can be downloaded from the website. 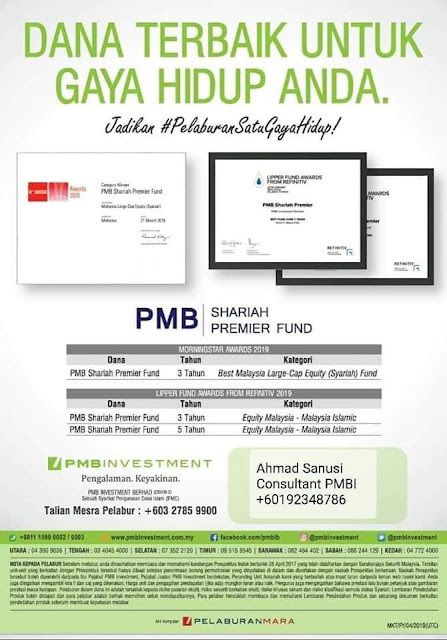 The history of PMB Investment can be traced way back to 24 June 1967 when the then Amanah Saham MARA, now Pelaburan MARA, was established and subsequently launched its first unit trust fund in the following year on 6 April – the fund was named Kumpulan Modal Bumiputera Pertama and is now known as PMB Dana Al-Aiman. 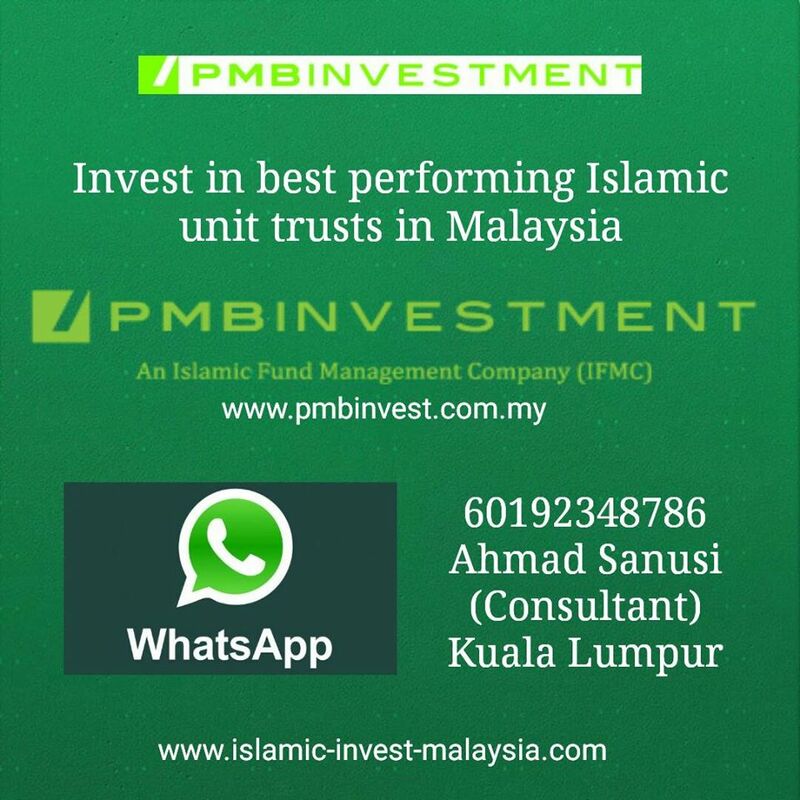 PMB Investment was incorporated on 15 January 1993 as ASM MARA Unit Trust Management Berhad. It assumed the unit trust operations from the then Amanah Saham MARA and its related staff. 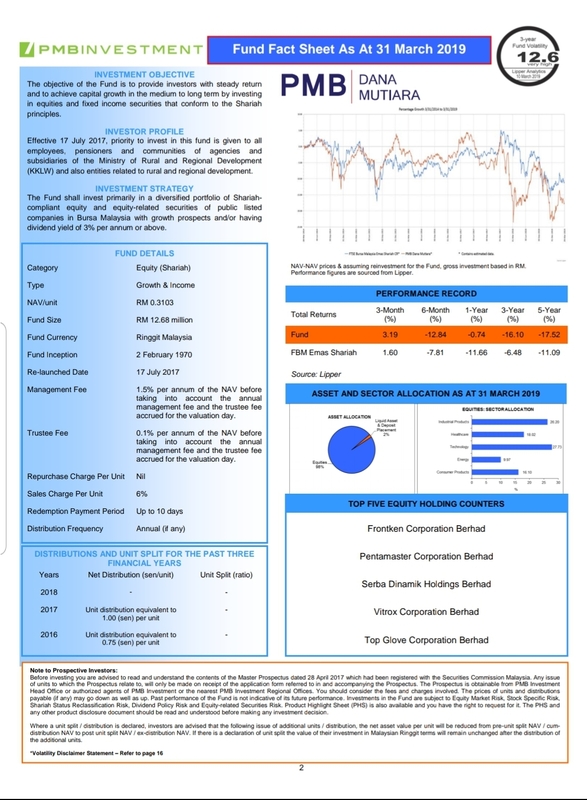 This was done following the requirement that unit trust funds are to be managed by a unit trust management company. 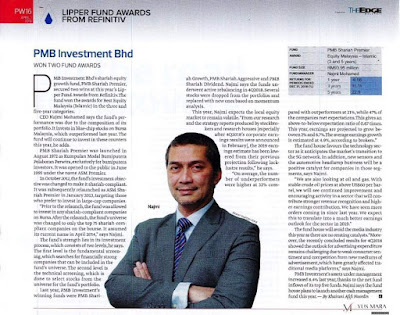 ASM MARA Unit Trust then changed its name to ASM Investment Services on 9 October 2006 and took over the fund management operations of ASM Asset Management Sdn Bhd. This is to streamline the unit trusts and portfolio management activities of the group. 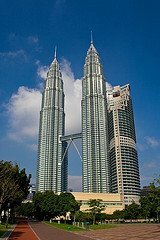 ASM Asset Management was incorporated on 16 December 1996 and was then another wholly-owned subsidiary of the then Amanah Saham MARA. PMB Investment Berhad is licensed under the Capital Markets and Services Act, 2007. 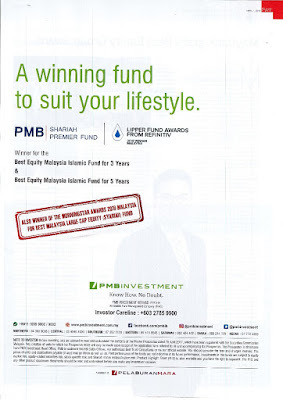 The company has an authorised capital of RM10 million, of which RM9 million has been fully paid. 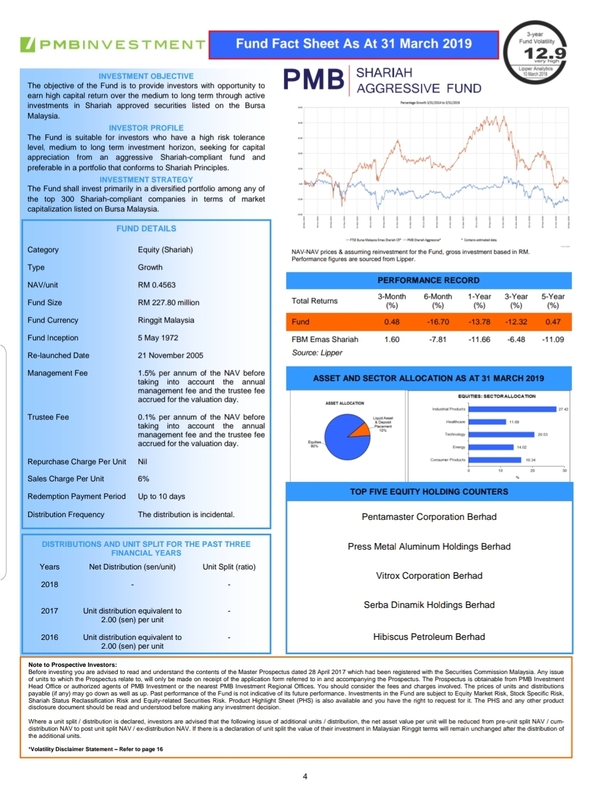 As at 31 December 2018, we managed 15 unit trust with the total fund size under management for unit trust funds, wholesale funds and portfolio mandates was RM1.09 billion as at 31 December 2018. Simpanan Asas ialah satu jumlah simpanan dalam Akaun 1 yang ditetapkan mengikut umur bagi membolehkan ahli memperoleh simpanan sekurang-kurangnya RM240,000 pada umur 55 tahun. 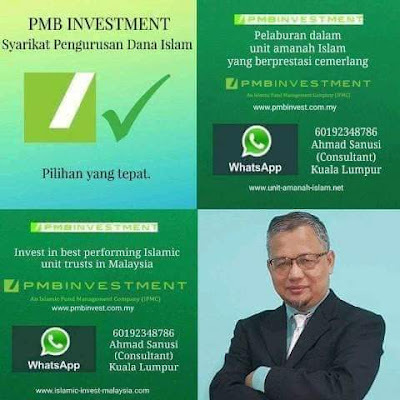 Ahli boleh melaburkan simpanan dalam Akaun 1 yang melebihi Simpanan Asas dalam produk dan menerusi Institusi Pengurusan Dana (IPD) yang dilantik. 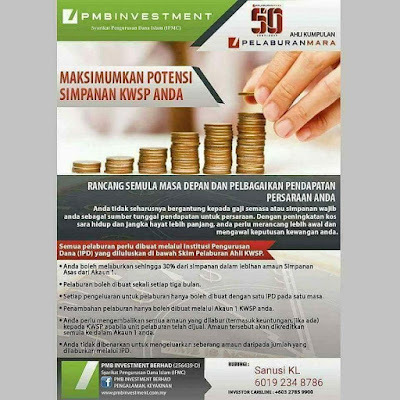 Ahli boleh melaburkan simpanan di bawah Skim Pelaburan Ahli KWSP tidak melebihi 30% daripada jumlah simpanan yang melebihi Simpanan Asas dlm Akaun 1. 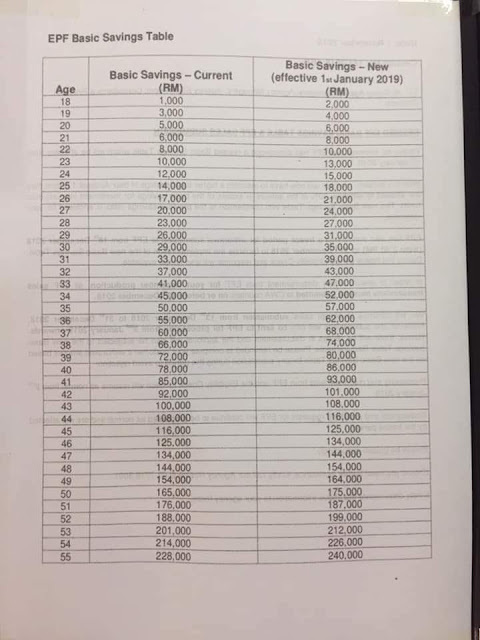 Pelaburan ini boleh dibuat setiap 3 bulan selepas tarikh pelaburan sebelumnya, dan jumlah minimum pelaburan ialah RM1,000.00. 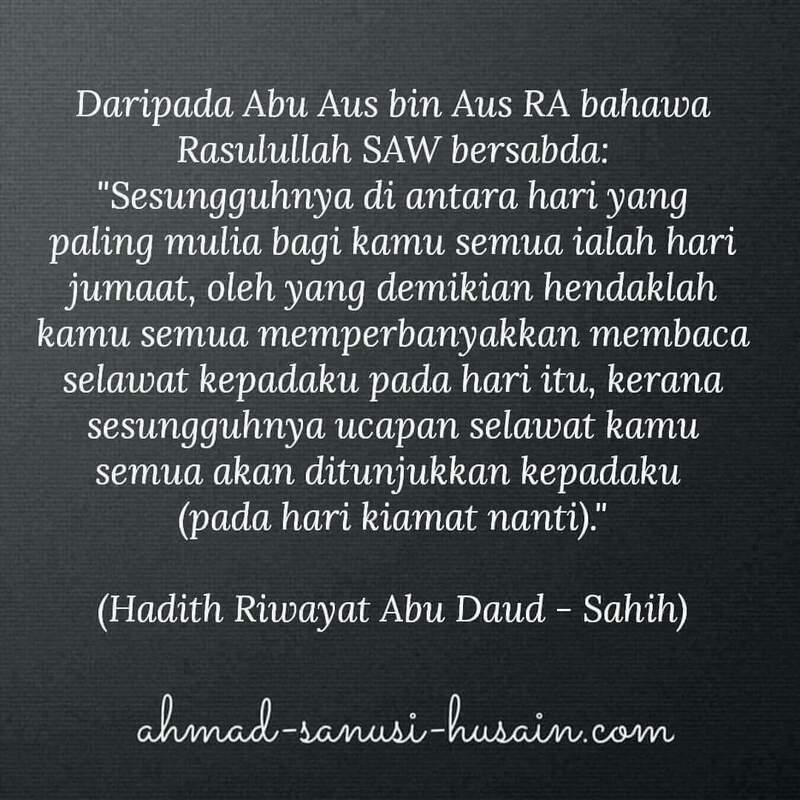 Jumlah Simpanan Asas adalah seperti jadual di bawah. 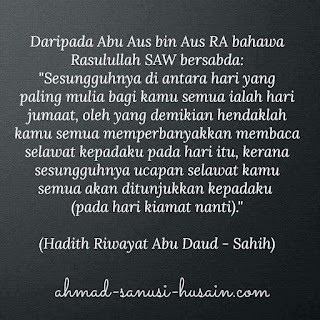 Setiap 3 bulan boleh dikeluarkan lagi. 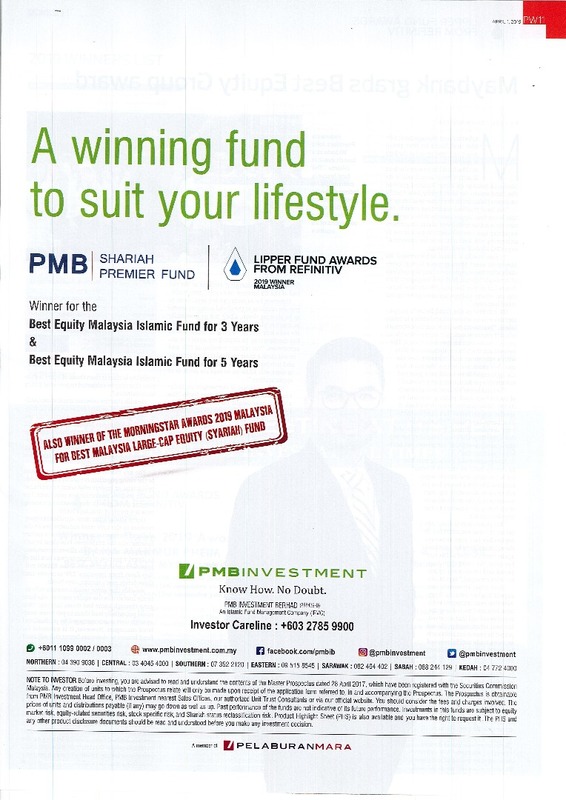 Alhamdulillah PMB INVESTMENT won 2 years in a row for PMB Shariah Premier Fund. 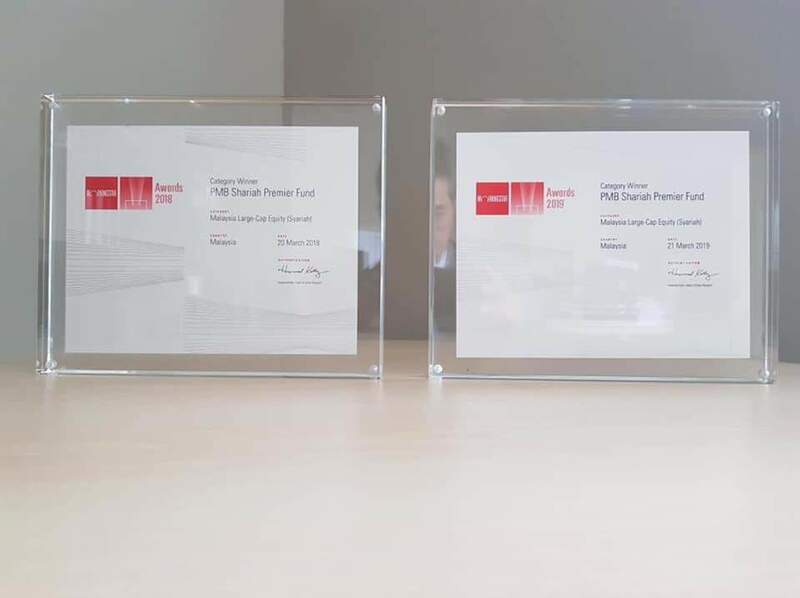 Thank you very much to our investors for your relentless support and all PMB Group staff especially Investment team for achieving this precious accolade. The success is a testament to our proven investment methodology. *For residents of Malaysia & MM2H holders only. KUALA LUMPUR 7 Mac - PMB Investment Bhd. 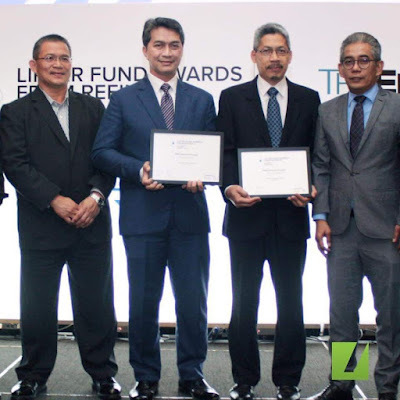 (PMB Investment) menandatangani nota kolaborasi strategik bagi program keusahawanan syariah dengan Etiqa Family Takaful Bhd. (Etiqa) dalam usaha memantapkan perunding unit amanah (PUA) PMB Investment. Pemangku Ketua Pegawai Eksekutif Kumpulan Pelaburan MARA, Tengku Ahmad Badlishah Raja Husin berkata, melalui kerjasama ini, Etiqa akan membantu PMB Investment memenuhi keperluan latihan PUA. “Kerjasama strategik ini akan memberi ruang kepada PMB Investment bagi mendapatkan kepakaran teknikal daripada Akedemi Etiqa terutama bagi perkongsian pengetahuan mengenai jualan dan kepemimpinan,” katanya pada majlis menandatangai nota kolaborasi strategik tersebut di sini hari ini. 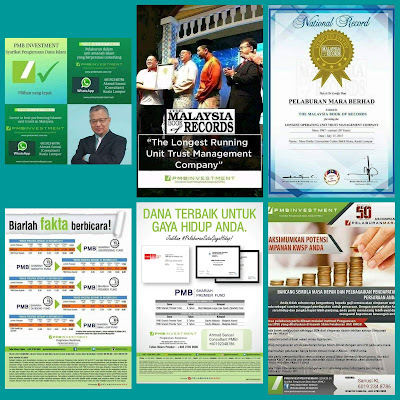 Terima kasih dan tahniah kepada ahli pasukan perunding dan para pelabur. Did you know we can start investing as early as 18 years old? Did you know we can start investing as early as 18 years old? A study shows that millennial investors (aged 18-39) are four times more likely than older investors to invest their money and grow their assets to achieve their financial goals. 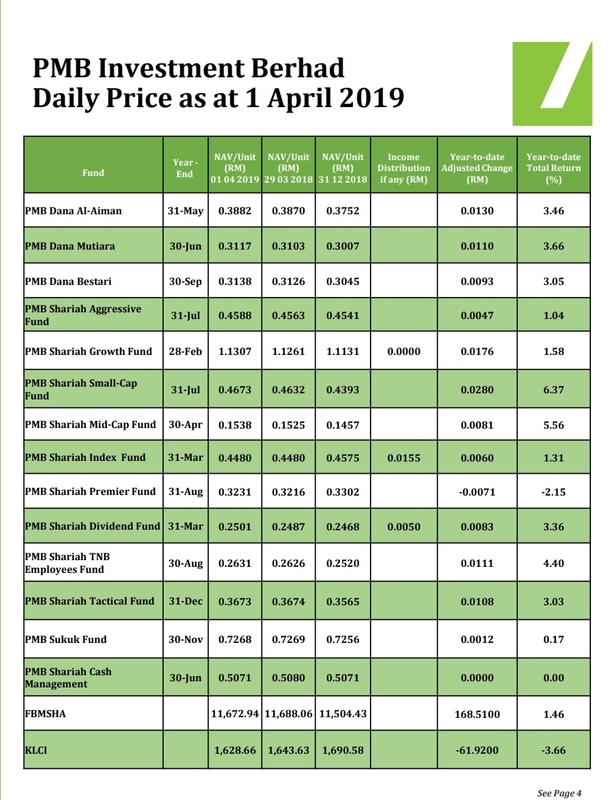 4 dana PMB INVESTMENT mencatatkan year-to-date return seperti pada 20 Feb 2019 melebihi 7% (dlm 51 hari dari 1 Jan 2019). Kecemerlangan prestasi dana-dana patuh Syariah PMB INVESTMENT setakat ini dlm 2019 berterusan. 2 dana PMB INVESTMENT berada di 2 tempat teratas dlm Top Gainer Funds (1 month) seperti pada 11 Feb 2019. PMB Dana Mutiara meningkat +7.91% & PMB Shariah Mid-Cap meningkat +7.67% dlm tempoh sebulan sehingga 11 Feb 2019. 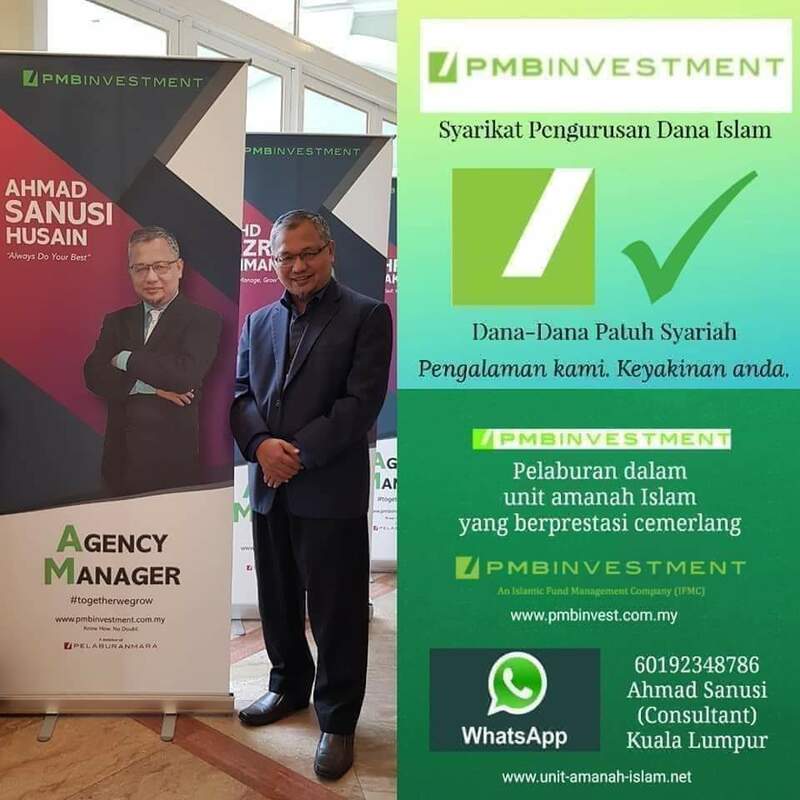 Kecemerlangan prestasi dana-dana patuh Syariah PMB INVESTMENT setakat ini dlm 2019 berterusan. Contohnya PMB Dana Mutiara merekodkan year-to-date total return sebanyak 7.02% sehingga 19 Feb 2019. 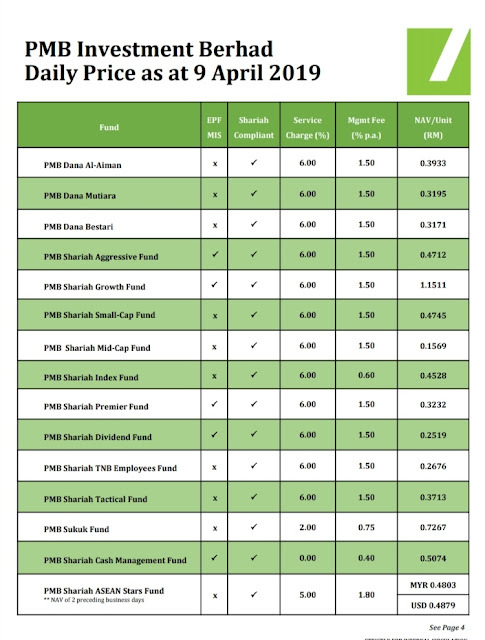 Jadi dana ini mencatatkan kenaikan nilai sebanyak 7.02% dlm tempoh 50 hari (sejak 1 Jan 2019). 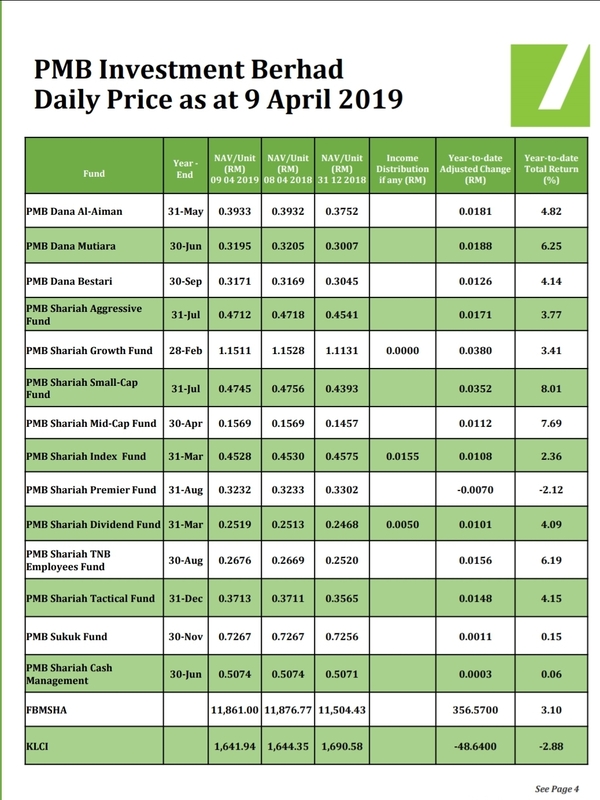 2 dana PMB berada dlm Top 3 funds utk pulangan 1 bulan (Top Funds - 1 month). Seperti pada 19 Feb 2019. Prestasi year-to-date setakat ini dlm 2019 utk dana dana PMBI sangat memberangsangkan. 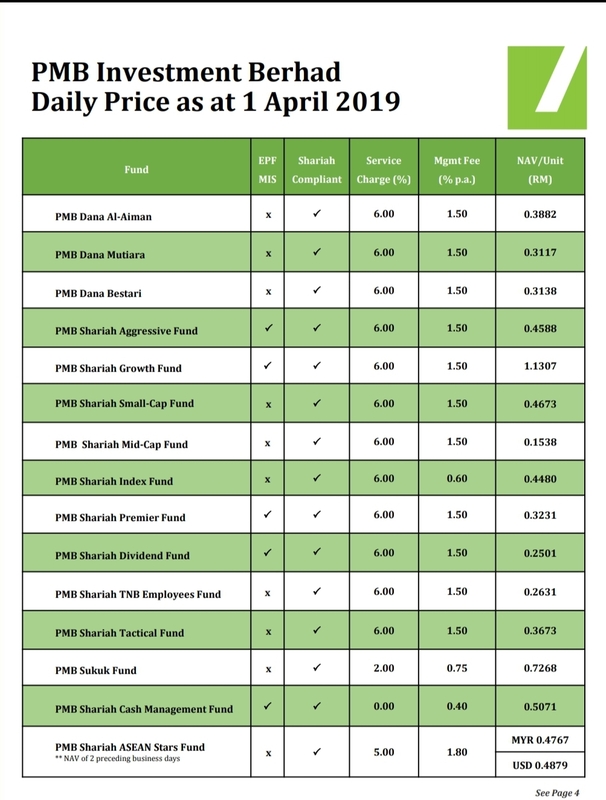 Contohnya pulangan year-to-date sehingga 14 Feb 2019 utk PMB Shariah Small-Cap Fund bersamaan 6.12% (kenaikan nilai utk tempoh 45 hari sejak 1 Januari 2019). As at end Dec 2018, 689 or 76.4% Shariah-compliant securities were listed on Main and ACE Market. 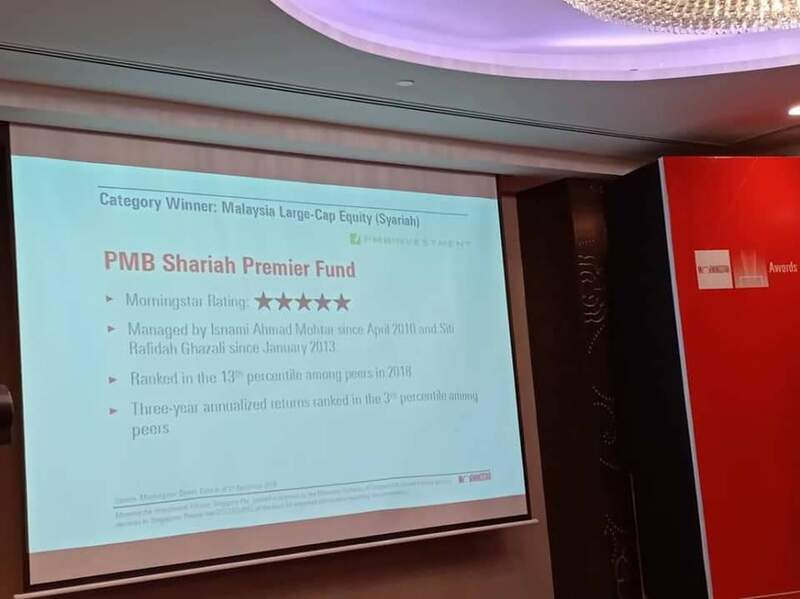 With a wide range of Shariah-compliant securities, investors are now able to choose to invest in over 20 types of economic sector to cater to investors’ diverse investment appetite. 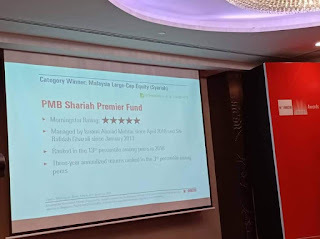 Alhamdulillah, pulangan utk dana PMB INVESTMENT utk tahun in setakat tarikh ini (year-to-date return) seperti pada 31 Januari 2019 menunjukkan pulangan sehingga 3.69% (PMB Shariah Small-Cap Fund) iaitu dlm tempoh 31 hari dlm tahun 2019. Masa yg baik utk turut serta dlm momentum peningkatan ini.